Future and Found is, if you’ll excuse my dodgy pun, a seriously stylish find. A sweet discovery I made on a home shoot for LivingETC some months ago now (we had these deceptively delicate coffee pots on loan) I made it my mission to get to the shop in Tufnell Park and meet its founder Andrea Bates. Having recently moved, the shop is now settling in to its new location; a former factory complete with original metal framed windows, industrial brickwork and concrete flooring. Designed in a way that allows each carefully selected piece to shine without the feeling of clutter, the space is small and perfectly formed. I love that, by way of connecting with its name, you have to discover the shop for yourself, starting with a short walk through a covered walk through to a courtyard, where Andrea and her “right hand gal” Grace Poulter curate the space with outdoor decor, depending on the season. With a former career as a buyer for Heals and, more recently, Jamie Oliver, it’s clear that Andrea’s experience has influenced her choices in creating the Future and Found brand. Her Scandinavian aesthetic is crisp, clean and functional with a focus on hand-crafted, design-led pieces, grounded in a monochromatic scheme but given a lift with pops of neon. The shelving scheme was a custom design where the struts have been secured into the wall plaster-a stylish idea for open shelving in a kitchen or living space, don’t you think? 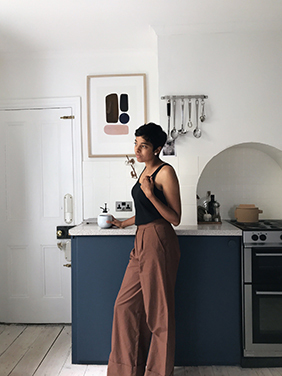 Amongst the future design classics from the likes of HAY, and Muuto are emerging British designers, including Kangan Arora, and ByAlex. With the London Design Festival now in full swing, Andrea and Grace will be on the look-out for new products from promising designers to bring back to the shop. She tells me that unlike large department stores where the time from sourcing and buying a product to getting them onto the shelves can take months, as a smaller set-up, Future and Found can discover pieces and make them available much faster, a freedom she very much enjoys. I couldn’t take my eyes off these beautiful, handmade ceramics by Bel Art Creation based in Tunisia. Having recently re-styled our living space with a strong, monochromatic feel (more on that very soon!) it’s a look I can’t take my eyes off. Working with so much colour as I do, and wary of the trends that come and go, I feel more and more drawn to the simplicity of black and white. So many beautiful, covetable pieces for the home. Thanks for having me girls!